Download and install Total Video Downloader for Mac. This step-to-step guide will help users to download any video, music and live streaming video easily and quickly. Users can enter a video website on the front page of Total Video Downloader and browse the media file they want to download. They also are able to copy the URL of the desired media files from other stand-alone browsers (such as Safari and Firefox, etc.) and paste the video link to Total Video Downloader for Mac. Users are allowed to get all the potential subtitles of the target videos. Just click "Paste URL" to analyze the target video link, then users will be allowed to download all the available subtitles. With this advanced feature, users can enjoy foreign movies without limit! Play the video with Total Video Downloader for Mac, then a download box will pop up to ask users to confirm their download! Users are able to select the format of files being downloaded on the download box of Total Video Downloader for Mac. Click “OK” to start downloading the target media files. 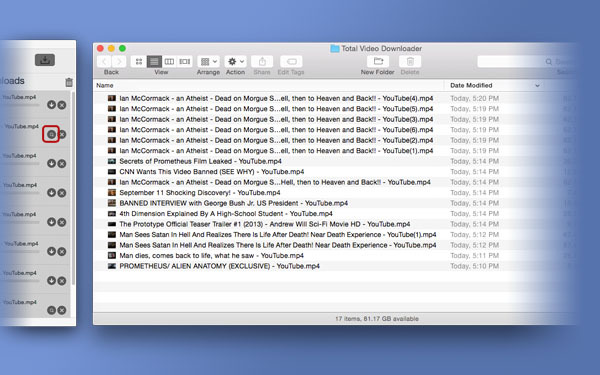 When Total Video Downloader for Mac completes downloading videos, music and live streaming videos Mac, users can click the "search" button to locate the downloaded files in the "Movies" Folder of the system, thus they can easily find out the downloaded files and enjoy them anytime and anywhere.